This review is forthcoming in the next Review and Expositor Theological Journal. The theme of the Spring 2013 issue is “Christianity and Economics” and it is largely the product of a series of papers presented by myself and a host of other academic and pastoral colleagues at last years LeftForum @ Pace University in New York City. The end of 2011 was characterized by a great upheaval and public response to unchecked capitalism across the globe, particularly as the meltdown known as the Great Recession continued to have lingering effects. Images of Zuccotti Park and Occupy protests arose over night as it was becoming more and more clear that nation States and big money had disclosed the real nature of their corrupt union via bailouts and the mystical creation of excess liquidity. Into this vacuum of despair emerged a number of grassroots and academic responses. Indeed, the very grassroots Occupy movement was not the work of the proletariat; it was the brain child of professors of anthropology that were able to organize this resistance to a system that has become too big for anyone to stop. Too often, however, the literary and media aspects of the resistance and cultural critique were from the far left intellgentisa. This, and unfairly so, allowed too many folks across various political and religious persuasions to dismiss these events as fringe movements of the Left that were simply trying to usurp societal order and restore the ever feared “S” word: SOCIALISM. Elitist, agnostic leftist and progressive academics and activists were the ones loudly critiquing the many hallmarks of capitalism. Secular culture was engaging and judging itself, while the church and theologians stood idly on the sidelines not wishing to engage this very material problem. While some of our pastoral colleagues in New York were leading marches carrying the golden bull of Wall Street, images that reminded us all of a similar biblical incident involving another golden bull, other pastors were left lost in the gaze of capital and speechless as to how the Christ event might actually become suddenly very practical. Into this context, my colleagues and I considered it a worthy endeavor to go the scene of the Protests, New York, and to ask in what ways might Christianity challenge the systemic evil of our current economic forms of exchange and how might we communicate this to a population that largely sees Christianity complicit in the conservative neo-liberal economic agenda? To this end, we were the only group of Christian pastors and theologians that presented papers at last years LeftForum, a conference that had nearly 400 various presentations and speaking engagements. We were the group that refused to allow post-metaphysical thinking to drive the agenda of critiquing the systemic economic ills plaguing us all. While our leftist colleagues were all around us invoking the names of Trotsky, Marx, Luxemburg, Lenin, etc., we were invoking Christian hyperbole, Hebrew Bible social justice texts, Continental Christian theology and even the likes of the most evangelical of them all, John Wesley. We were challenging the assumption that in order for one to offer an alternative to the unchecked flow of capital and the eschatological dead end of accumulation, one must also abandon Christianity and theological reflection. In fact, as will be argued in some our essays for the upcoming journal, one is not able to stand with the 99% if there is an a priori dismissal of one of the single largest components that the 99% use to navigate the world and make sense of their existence: faith/religion. We partook in the project with the firm belief and resolve that if we will but only listen to the voices of the Christian past and present, we will find a wealth of resources that will not only call the evil of our present capitalist driven society to the floor, but it will also refuse to let Christian theology and praxis be co-opted by ideological forces that try to confuse their democratic or republican agenda with Christianity. This has gone on too long and it must stop. To this end, along with various articles that will propose a revolutionary core of Christian theo-economic discourse, several reviews will be contained in this journal that reflect Christian pastors and theologians engaging in texts that are primarily economic in nature. The purpose is to embody how theology and economics might begin a dialogue that is being sorely neglected by much of the church. People of faith should not be disinterested in these matters, for the very folks to which ministry is offered are the ones who are living this economic hell that seems to hang over us like a never ending purgatory. 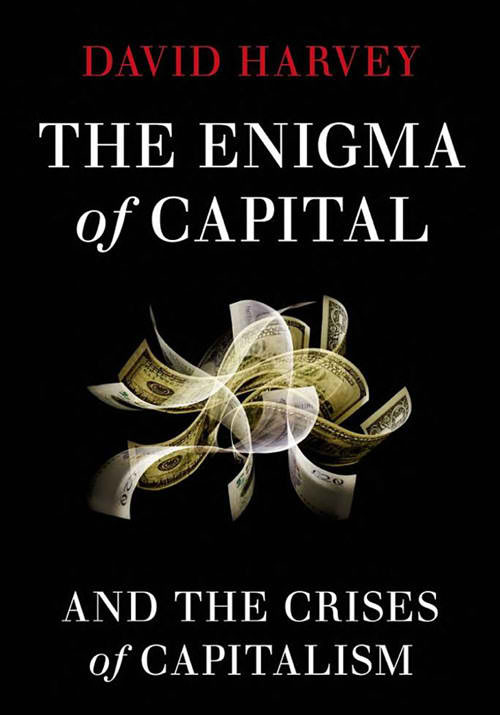 Thus, this review of David Harvey’s Enigma of Capital is another aspect of engaging Christianity with contemporary economic theory and making resolute our claim that Christianity is not something that is passe or irrelevant during this time of economic change; indeed, it is pivotal if we are to engage cultural phenomena and respond in holistic ways that are not only healthy and economically viable but also comprehensively salvific. Professor Harvey’s book is a passionate Marxist analysis of the current economic meltdown and a review of how libertine capitalism has created the current wreckage. His thesis: capital flow is a system of exchange that is built upon inherent contradictions and fabrications that will organically create more crises than solutions. He notes that various capitalist crises have been recurring with ever greater frequency since the 1970’s (the emergence of credit) and that this most recent Great Recession is simply a foretaste to the destabilizing of systemic neo-liberal economics that cannot continue ad infinitum under the weight of its own means of production and expectation of a compounded 3% growth. This is why Dr. Harvey calls the recent economic calamity a crisis; it is the rationalization of the irrationality of continual capital accumulation and capital flow. While economists and politicians the world over are replete with reasons for the current financial crises, Harvey summarizes the issue with a simple definition of capital early in his text. Upon rehearsing the latest “Disruption,” writing one of the most concise synopses of the recent global meltdown and its many domino effects, Harvey presents to us the central concern of his text: Capital flow. He writes, “Capital is not a thing but a process in which money is perpetually sent in search of more money.” This central idea for Harvey’s work demonstrates how this perpetual search is the enigmatic instigator of capitalist crises. This is the problem with capital: its goal is itself. Capital is a means of creating surplus (profit) relative to the cost and value of services or products produced. This surplus of production, known as capital, has to find newer places of expansion so that continued production and surplus can be absorbed in the market that would allow the process to continue unabated. Capital, however, is beginning to encounter obstacles that disrupt this flow. Capitals relationship to labor, nature, the lack of new markets into which capital may expand, and excess liquidity to pacify the capitalist symptom are just a few of those obstacles. When this happens, economic crises emerge. Crises disclose the unstable logic of capital, and thereby create the potential for newer systems of exchange that might prevent future occurrences. As Harvey notes, “Crises are moments of paradox and possibility out of which all manner of alternatives, including socialist and anti-capitalist ones, can spring.” Ironically, capital ends up creating an environment in which its own future is questionable. The coherence of Harvey’s argument is very structured and easy to follow. The text has eight chapters, but it can easily be divided into two sections. Section I (chapters 1-5) is the description of the global meltdown, along with the definition, character and polyvalent functions of capital. This section is a rigorous dialogue with Marxist theory and a scolding critique of neoliberal economic theory that has been embraced by most modern Western nation states. Section II (chapters 6-8) offers a description of how the natural breakdown of capital affected the entire globe and how the endless accumulation of capital is reshaping many different environments into a form of “second nature” that could have catastrophic consequences. Concluding this section, Harvey offers his own resolutions to the crises capitalism that will certainly challenge his readers. Overall, Harvey’s text is a good balance between common public prose and an academic analysis of capital. It is a text that can be approached by laymen of economic theory, yet also offer challenges for those of a more academic persuasion. While Harvey is clearly writing from the Left of the economic and political spectrum, his writing is very balanced and he often does a good job of swaying away from ideological quagmires that would distract his audience from his argument. Even though his solutions seem ultra-liberal and utopian, and these admittedly so, the genealogy of capital that he traces leaves little choice to continue down the same unambiguous path. As an augment to this journal, it should be noted that pastors, theologians and ministers should be reading this material. Economic despair and imbalance is going to be one of the major challenges of the coming decades and the church needs to be informed. Harvey is describing the economic reality of those to whom we minister. If the church continues to be a handmaiden to particular political ideologies then it will continue to be speechless in the marketplace of discourse. Yet, if one is convinced that Christian theology can narrate a different world and is creative enough to offer an alternative reality to the dismal picture of conservative and liberal polarities, then just maybe our eschatology can be begin to take on the shape of Christ and refuse the shape of capital. JD- I have read Weber and his stuff was definitely a needed critical perspective at the time of its writing. I think he oversimplifies economics and reaches too far with the Protestant ethic, but his work still offered good anthropological and sociological insights. There have recently been a host of scholars who are arguing that Protestantism as a historical movement created the space out of which capitalism could emerge. Most notably, Mark Taylor in his book “After God” and many of the radical orthodox thinkers such as John Milbank make the similar arguments elsewhere. For another more current text, check out D. Stephen Long’s book “The Divine Economy.” Excellent take on thinking economics within a trinitarian paradigm. It is a bit Utopian in its offerings, but so are most texts that seek alternatives to socialized capitalism. Nevertheless, Long offers some excellent analysis and a challenging read. Thanks for your interest in this topic and for your comments.